This is going to be the easiest and shortest movie review I have ever written. This one comment will pretty much describe the film in its entirety and describe how important it is that you see it. Are you all ready for it? Here we go! I'll even bold it for effect. Thanks for reading, go see it. Ok, so maybe it can't be that simple, but you have to admit that single comment says so much. Pixar has a strong history of amazing animated feature films. Their stories always have amazing depth and feeling, sometimes more depth and feeling then most films these days. For a child, the films are fun and for the adults they are all too human. 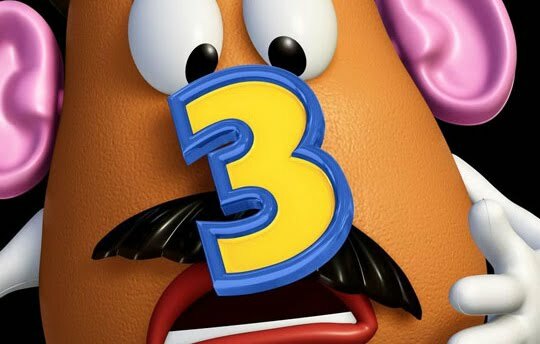 To say that Toy Story 3 is the best Pixar movie yet is a monumental judgment call considering Pixar is the juggernaut studio that produced such masterpieces as the first two Toy Stories, the futuristic Wall-E, the romantic Up and the fun-fueled Monsters Inc. (just to name a few). And while I am now reminded how amazing each movie is, I am still willing to stand behind my initial statement. Andy is now graduating from high school and I getting prepared to go to college, yet he can think of no better way of repelling the ladies then by having a full toy chest at the foot of his bed. After numerous unsuccessful attempts by Woody, Buzz and crew to get Andy to play with them, the forever loyal toys decide it is time to pack up and retire to the attic where Andy may sometime call upon them again in the future. Following a mishap, the crew splits up and an impending doom is thrust upon them. It is now for the toys to decide whether to ride out a sticky situation or get back to their rightful owner, Andy, before it is too late. The technical aspects of the film should go without saying. Pixar is always the best studio when it comes to their animation, voice acting and soundtrack. They truly have mastered the art of computer animation to the point that it is seamless and you forget that it is in fact an animated feature. Everything just seems to fit and act natural. Nothing unexpected here. The story is what really gets me. Now, the love sequence from the film Up has to be one of the best sequences of all Pixar films but Toy Story 3,in its entirety, has the strongest story. It is a seemingly complex story of loyalty and love that harps back to the original two films of the franchise. Yes, we are talking about toys here, but what Toy Story 3 has done is masterfully tricked you into believing that Andy and his toys are bff's! What we're really looking at then is how do you feel about saying goodbye to your best friends? Heavy, right? With tons of laughs and gratuitous slapstick humor, the film flawlessly weaves a spectacular web that concludes that greatest animated franchise of all time perfectly. The Gypsy Kings even cover "You Got A Friend In Me" for the credits! What more could you ask for?! I'm sure you've seen the other two Toy Stories, right? So what are you waiting for? Forget vampires and werewolves. Forget air (gender)benders. Who cares about A-teams or Kung-fu kids?! Toy Story 3 is the best film of the year so far and, in my opinion, as close are you're going to get to a perfect movie! FYI. I'm saving my strongest statement of all for the end. I saw this movie two weeks ago and all I can come up with is the most un-clever review I have ever written. HIYO!